How do we remember the times that are so far in the distant past that they are not only beyond history, but beyond memory? The ocean of time that earlier humanoid species and humans crossed before they even reached the outer boundaries of history is enormous: the Stone Age lasted 2.5 million years. Archaeological and geological research is almost our only means of telling what transpired in that period. Occasionally, these disciplines draw from astronomical findings, as with the report just out that the Earth may once have had two moons. A new hypothesis claims the Earth may once have had two moons, which eventually crashed together forming our current celestial partner. This new idea, reported in the journal Nature, could explain a long standing puzzle about the differences between the near and far sides of the lunar surface. The near side is relatively low and flat with many large dark basalt mare, while the far side is high and mountainous, with thicker crust. The work, based on computer simulations undertaken by planetary scientists Erik Asphaug and Martin Jutzi from the University of California, Santa Cruz, claims the lunar far side highlands, are the solid remains of a collision with a smaller companion moon. While legends, ancient religious writings and folklore cannot be taken literally, they may contain weird, displaced grains of truth. For example, it is strange how old wives' tales preserve centuries' worth of domestic wisdom and tried-and-true practices: superstitions about cats bringing ill omens around nurseries turned out to have some credibility, as research into cat-borne diseases later showed. 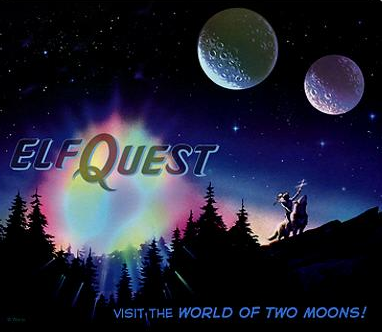 In this case, the imaginary world of Elfquest features a fictional world with two moons. Do myths, old or new, preserve bits of the distant past beyond memory? Can fragments of these tales catch a glimpse of lost reality? No. It would be foolish to assume that the Pinis, who created Elfquest in the late 1970s, somehow accurately imagined our planet's real prehistory. But the 'two moons' here are a curious coincidence, which raises some questions. What fundamental elements of human existence persist in oral tradition across aeons? What is the basic common denominator of Ur-memory - what cultural material survives? And how are these surviving fragments dressed up in ways that make them comprehensible now, for each new generation? Pioneering work was done in this field by the Brothers Grimm in tracing fairy tales in Central Europe, even as they tracked the philological evolution of the German language. Other attempts to categorize and thereby follow the spread of fairy tales and folktales include the Aarne Thompson classification system and Krohn's historic-geographic method. But these systems deal with the core elements of stories across centuries or even millennia at most (through references to Greek texts). They don't cover many thousands, or even millions, of years. If myths mirror any literal truths that scientists later confirm, it's equally worth considering that researchers' interpretations of scientific results are sometimes coloured by contemporary expectations. Fantasy and science are on opposite sides of the looking-glass. In this case, Millennial dualism likely reflects in the latest theory that Earth once had two moons. It's not that the science doesn't stand on its own: it can and often does. But the flavour or tone of scientific interpretation - its metascientific subtext - is influenced by the Zeitgeist. Dualism is fashionable right now but it's as old as the hills: dualistic legends focus on metaphors for the human struggle away from savagery. Fantasy's classic parables involve the struggle between good and evil in the human heart. In Elfquest, a Stone Age Earth with two moons is visited by aliens - the Elves - who get stranded on our planet. Using their highly evolved abilities, they interact with the earthly environment, and the result is a lot of strange, hybrid beings who are feared and worshipped by Stone Age humans as evil spirits and nature gods (see my posts on Elfquest here and here). Primitive and advanced, familiar and alien, Elfquest's two moons may symbolize duality of consciousness. Duality is a persistent motif in human stories across millennia. Modern legends, from popular fantasy novels to pulp fiction comic books, merely perpetuate the material once transmitted by oral tradition. Greer and Robert in Bed NYC (1982) © Nan Goldin (Guggenheim). Pausing by a fjord road in Norway. Image Source: Dark Roasted Blend. There were always intrepid people who pushed beyond safe and well-trodden paths. Explorers, saints, pilgrims, warriors, conquerors, settlers. It will take their kind of daring to one day colonize Mars. The fluid values of the Millennium seem to generate existential questions that are answered, in some quarters, by extreme sports. People have never had so many chances to push beyond their psychological, physical and environmental boundaries as they have now. They have more high-tech equipment and more opportunities to get to places where they can test themselves. There are whole sub-cultures geared toward challenging these limits, see just a few of them below the jump. For those who prefer to challenge themselves from their living rooms, video games are producing environments that simulate the same experiences. 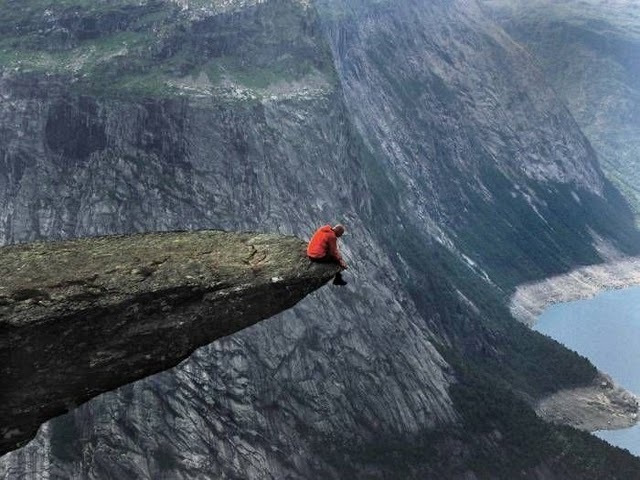 The Pulpit Rock hike, Norway. Image Source: Dark Roasted Blend via Susi Varming. Hats off for a wonderful recent post (here) at Post-Mac Blues on light painting, a photography technique that looks like it is digitally manipulated, but isn't. This is a shameless repost on light art performance photography (LAPP). It involves playing with light in front of a camera that is using super long exposures and LED lights. 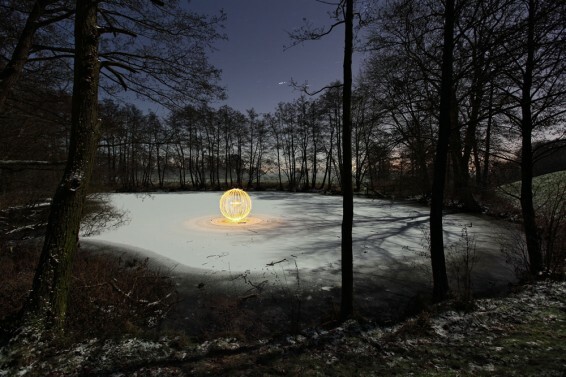 The distinctive photos are from the German photo light artists, Jan Wöllert and Jörg Miedza at LAPP-PRO - go to their site to see many more amazing light photos from 2007 to the present (the menu is at the bottom of the page on the site, to get a new collection from each year, change the year in the top menu). Wöllert and Miedza go a long way toward capturing current sensibilities, with their stark juxtaposition of traffic-light neons against Urbex environments, night streets, and abandoned country landscapes. This is so cool: the Chronicle of Higher Education is reporting that Stanford University, one of America's top undergrad schools and a leading university worldwide, is offering an opportunity to audit their first year undergrad course in Introduction to Artificial Intelligence - for free, online this fall. You can sign up, now, here. A prominent robotics professor and a Google executive are opening up admission to their popular Stanford University course on artificial intelligence this fall to anyone online, and they have even promised to issue grades and certificates to those auditing virtually. The course—which is taught by Sebastian Thrun, a computer-science professor at Stanford, and Peter Norvig, director of research at Google—is among the largest at the university, with nearly 200 students typically enrolling each term. Those who want to join online need not register with Stanford officials or make their way to Palo Alto, though. The online course will run in tandem with the physical class from October to December, which means that online students will be expected to watch the same lectures, complete the same assignments, and take the same exams as their Stanford counterparts. Online students will not receive credit or formal recognition from the university—but they will receive grades for their assignments and exams, and those who complete the course online will get certificates created by the professors. The professors are unsure how many will sign up for the free online class, but interest appears high—more than 8,000 people have asked to be put on an e-mail list for more details about it since the course was announced late last week. Official enrollment hasn’t started yet. The course is an experiment in an idea called massive open online courses, where anyone with an Internet connection can take classes without paying tuition. 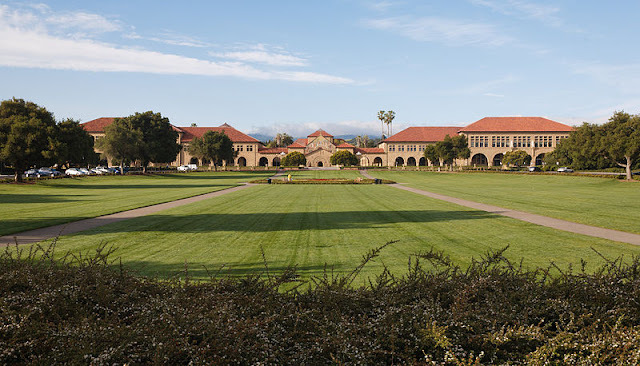 The professors are recommending that students buy the class textbook, which is co-written by Mr. Norvig, and dedicate at least 10 hours a week to the course, which Stanford considers an intermediate-level class that requires some mathematical and programming knowledge. Below the jump, see the instructors explain the course and its aims. Cover art, Alpocalypse (2011) © Volcano. Image Source: Wiki. 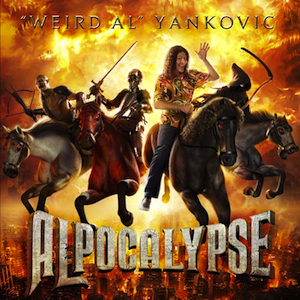 Thanks to J. for sending along a link (...) to a song from Weird Al Yankovic's latest album, Alpocalypse, which was released 21 June 2011. The song, Stop Forwarding that Crap to Me, is below the jump. Aimi Eguchi, non-existent Japanese pop sensation. Image Source: Washington Post via Youtube. The uncanny valley is a hypothesis in the field of robotics and 3D computer animation, which holds that when human replicas look and act almost, but not perfectly, like actual human beings, it causes a response of revulsion among human observers. The "valley" in question is a dip in a proposed graph of the positivity of human reaction as a function of a robot's human likeness. The term was coined by the robotics professor Masahiro Mori as Bukimi no Tani Genshō (不気味の谷現象) in 1970, and has been linked to Ernst Jentsch's concept of "the uncanny" identified in a 1906 essay, "On the Psychology of the Uncanny." Jentsch's conception was elaborated by Sigmund Freud in a 1919 essay entitled "The Uncanny" ("Das Unheimliche"). The perfectly-formed fake singer was made up of the very best of pop pedigree, with computer scientists plucking specific facial features from six of the most genetically blessed of AKB 48's real life female members. The cut-and-paste popstar was bestowed with eyes taken from Atsuko Maeda and a button nose from Tomomi Itano while her long, lush hair hails from Yuko Oshima and her sensual mouth belongs to Mariko Shinoda. Even her eyebrows were borrowed from pretty band member Mayu Watanbe while the mix of features were cleverly united within a face outline belonging to Minami Takahashi. But manufacturing your own AKB 48 idol, is not as easy as it looks. Skilled computer scientists used detailed imaging to highlight the points on the real-life girls' faces before their best features were captured and digitally implanted onto Aimi's virtual face. Still from Grave of the Fireflies, the saddest film ever made? I have often drawn a correlation between the breakdown or transformation of emotions and values and the spread of the Internet, virtual reality and mass information. There is a paradox here. The designers of virtual realities and cyberspace constantly strive for hyper-realism. Social networking site manufacturers, for example, seek to integrate our emotions and social behaviours into online experiences, rendering them more 'real.' CGI animators are pushing every closer toward creating seamless artificial humans who are undetectable as computer constructs. This literal-mindedness about reality extends to live-action film-making. As camera tech with digital enhancements improves, everything has to be more real than real to be believable. Yet the more real we strive to make our representation of reality, the less confidence we have in reality and its representation. This is especially the case when a film treats serious subjects. The harsher the message, the 'more real' the film has to be. In a typical Millennial attempt to quantify the unquantifiable, Canadian scientists have identified the 'saddest film ever made,' the 1979 boxing remake film, The Champ (here). In response, the famous American film critic Roger Ebert tweeted: "Canadian scientists who have never seen "Grave of the Fireflies" identify saddest movie of all time." In Ebert's view, sometimes hyper-realism makes serious subjects less believable. Hyper-realism leads to Millennial irony, where everyone and everything is taken so seriously that the audience finds it laughable. This straight-faced self-importance is the basis of successful American comedies driven by Gen X actors Owen Wilson, Will Ferrell and Ben Stiller and their contemporaries. Their comic take-off on intense Boomer Vietnam films, Tropic Thunder (2008), was a good example. It played on all the tropes of hyper-realism, including showing the making of the movie, while making the movie, while making the movie. You can see the trailer here. 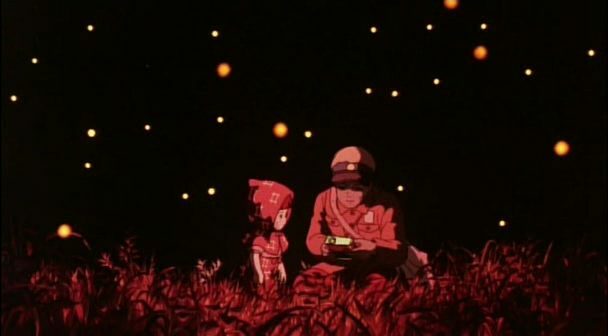 The 1988 Japanese animé film, Grave of the Fireflies (火垂るの墓, Hotaru no Haka), in Ebert's view, is one of the most powerful anti-war films ever made; he says: "it is the most profoundly human animated film I've ever seen." The heart-breaking sadness that hits home in this film depends in part on its naive animated style - in other words, on its unreal presentation. Sometimes, he feels, we need to know that an artistic treatment is just that, so that we stop looking at the artistry and start listening to the message the art is trying to convey. That's an interesting message for cyberspace enthusiasts who are pondering the value of virtual realities online that we increasingly inhabit. Are our experiences online becoming more real because we know that they aren't real? Below the jump, see Ebert talking poignantly about the tension between unreality and reality in this film; plus see a clip from The Fog of War (2003), in which the late Defense Secretary Robert McNamara describes the American firebombing campaign in Japan, and finally the animé representation of that same event in Grave of the Fireflies. The juxtaposition shows a sharp contrast between rationalized and less rationalized views of this part of World War II. Also, there is a blurring of lines, as the 1988 serious animated social comment confronts the 2003 dramatic documentary on the same subject.